F1 tickets for 2019 are not on sale as yet. The Russian Grand Prix will once again be held at Sochi. 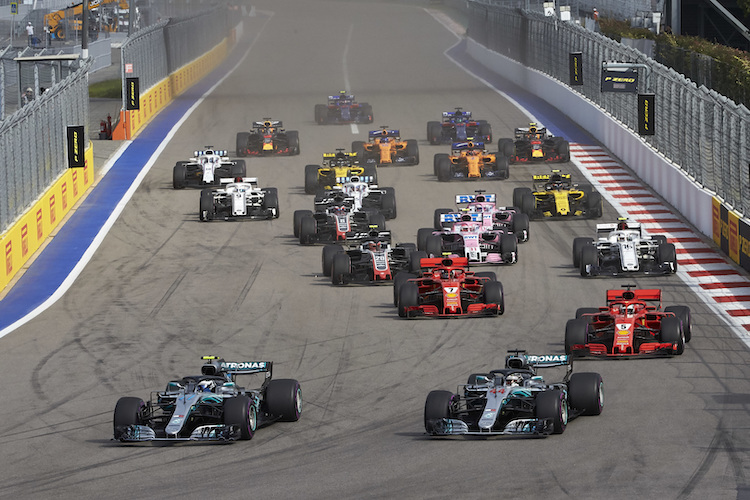 The Russian Formula 1 Grand Prix returns to the Sochi for the 6th time. The Mercedes AMG has dominated the race for the last 5 races with 3 wins for Lewis Hamilton and a win each for Valtteri Bottas and Nico Rosberg. General Admission Tickets start from £57 for a 3 day adult weekend ticket. There are 5 grandstand viewing areas for the Russian Grand Prix. Starting at approximately £81, The T4 Grandstand is the cheapest for a weekend ticket. It is situated on the second turn next to the General Admission area. The T3 Grandstand is the next cheapest option, starting at £75 for an adult Thursday to Sunday ticket. You will be seated in front of the first turn, but you will never be far from the action as this grandstand is in the middle of the track. The T2 Grandstand is located at corner 2 the first major breaking point of the circuit. Prices start from £87 for catagory 3 seats for Thursday to Sunday seat and £162 for catagory 1 seats. The T1 Grandstand is located at corner 6 after the long sweeping left hander. Prices for T1 Panorama seats start range from £87 to £143 for Thursday to Sunday seats. The Main Grandstand is the most expensive option, starting at £143 for an adult 4 day weekend ticket. However, it offers some of the best views as it is right on the start/finish line and just after the final turn. All 4 -day ticket-holders (Grandstand and General Admission) will have access to the Thursday pit walk, as well as the concerts on the Medals Plaza and F1 Village entertainment. 2-Day ticket-holders will NOT have access to the pit lane walk, however will have access to the concerts and F1 Village entertainment on the days that their tickets are valid. There’s a number of options for Sochi with a number of teams running their own packages for 2018. Please contact us for the latest availability and prices. Please be aware that you may need to acquire a visa to visit Russia. Please check with your local embassy for more information. Discounted child tickets are available for children aged between 2 – 12 years, for the T1 Grandstand only. A maximum of 2 child tickets for every 1 adult ticket purchased is permitted. Hi, I would be interested in getting a quote for flight and hotel as well as Paddock Club access for the Saturday and Sunday of the race weekend. I am not sure if you do the travel part but any info you could provide would be appreciated. I have been to Abu Dhabi GP twice now but fancy a change of venue. Hi Peter, I’ve sent you an email about packages for Russia.